Because Severalnines makes it faster, cheaper and plain better to deploy and manage your database clusters on AWS. Our embedded configurators support Percona XtraDB, MariaDB Cluster, Galera Cluster, MySQL Cluster, MySQL Replication, MongoDB Replica Set and MongoDB Sharded Clusters. For Galera users, we have worked on a deeper integration with AWS APIs to provision cross-region multi-AZ Galera clusters (see screenshot below). It might be a good idea to create another Super Admin user to replace the default user. This ClusterControl AWS instance acts as a centralized UI server from which to deploy and manage your clusters, whether they are on AWS or on servers in your own data center. Each cluster is deployed together with a dedicated controller instance. The centralized UI server manages a cluster through its controller. 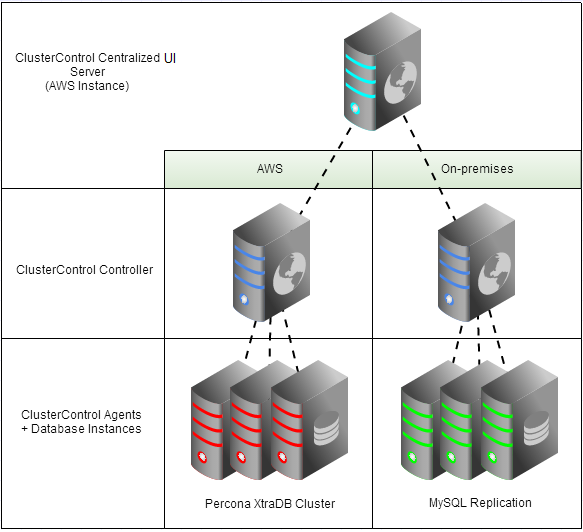 E.g., the diagram below shows how you can manage, from the same UI, a Percona Cluster on AWS and a MySQL Replication setup in your data center. 1. Enter your AWS credentials under the Service Providers tab. 3. Allow ICMP echo/reply between your AWS instances. If your database nodes use the ClusterControl - Community Edition-1-0-AutogenByAWSMP- security group, then add ICMP reply/request to it. From your AWS console, add a “All ICMP” rule to the security group. If you plan to use a custom security group for your database nodes, then add the ClusterControl - Community Edition-1-0-AutogenByAWSMP- security group to your custom security group. This will allow the ClusterControl instance to connect to the database nodes. You can read more about AWS security groups and default ports on our knowledge base. 4. 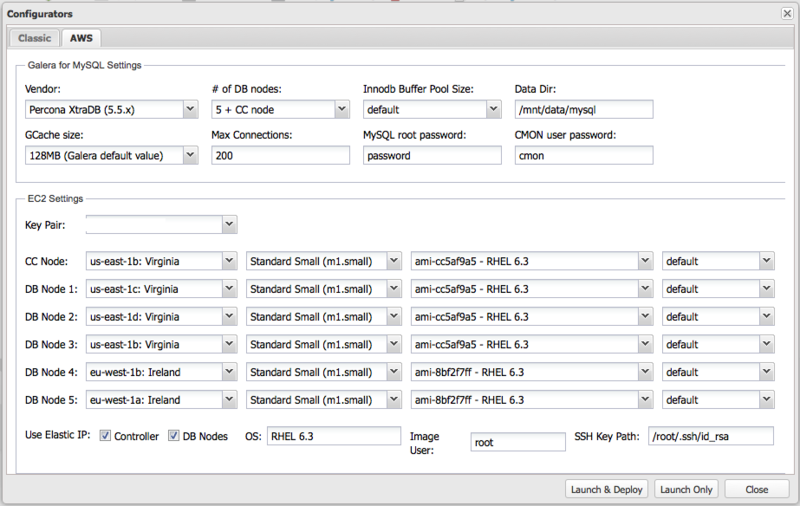 Click “Create Database Cluster” to launch the Configurator. 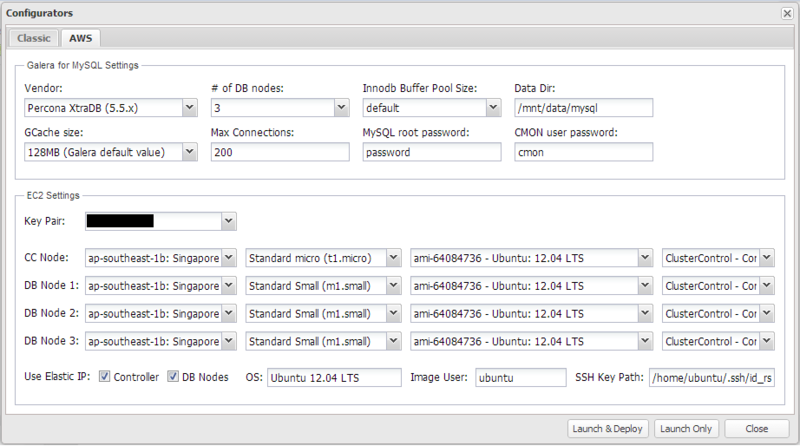 Here, you can choose the number of database nodes, as well as the region they will be deployed in. 5. Click “Launch & Deploy” to start the deployment. The whole process to spin up instances and deploy the cluster takes about 15 to 20 minutes, depending on the number of nodes and instance types. Using the same UI, you can deploy a database cluster on your own servers. 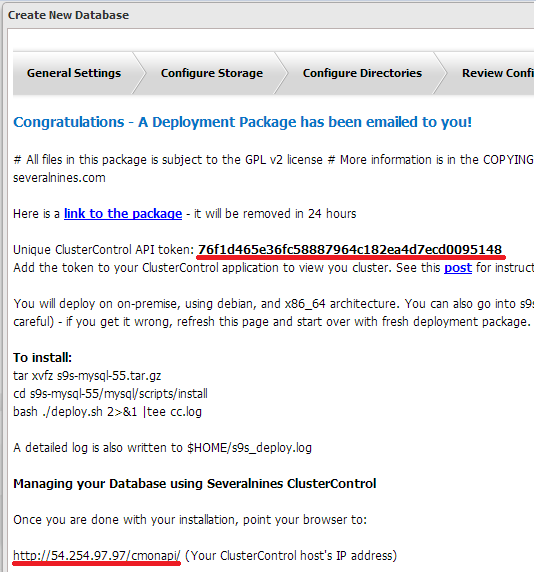 From the Classic Configurator, you would generate a deployment package and use that to install your cluster. Note the ClusterControl API Token and the address to the new cluster’s dedicated controller instance. You would need these to register the cluster to your ClusterControl UI. After the deployment, complete the Cluster Registration and your on-premises cluster will show up in the UI. That’s it. Deploying a sophisticated cross-region multi-AZ Galera Cluster on AWS is pretty straightforward. You can also use the UI to deploy clusters on your own servers or in other public clouds, and manage everything from one app. AWS Marketplace gives you the ability to rate and review our product, and we are very interested in your feedback.